If your dog or cat is having the occasional case of constipation or diarrhea, one of the things that might help is canned pumpkin. Yes canned pumpkin in its pureed form (NOT pumpkin pie filling) is a fantastic stool softener which makes it a good natural remedy for constipation. It often helps with upset stomach or indigestion for both cats and dogs. It is very rich in fibre and adding just one or two teaspoonfuls to your pet’s food often gets the system moving in no time. Dogs will occasionally want to eat it directly and that’s fine too. Sometimes though, finicky cats and dogs won’t touch it no matter what you do. On the opposite end of things is diarrhea. 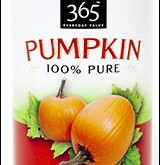 Since the dietary fibre in canned pumpkin absorbs water, it can be a great help to a cat or dog that has diarrhea. Some pet owners report that it firms up their pet’s loose stools or diarrhea within a few hours. Again one to two teaspoonfuls is all that is needed. N.B. It should be noted that both diarrhea and constipation can both be very serious and require immediate veterinary care depending on the cause. Whatever the cause, diarrhea or constipation lasting more than 24-36 hours requires vet care. Click the following links (in the related articles below) for more general information on diarrhea, constipation and intestinal disorder in cats and dogs. my dog mad is a peekapoo. sweet as an angel. she has been fine but today she has had a spell with loose stool and red blood in it. shes not her usual self today at all. although i am thing its the chicken and duck jerky treats she loves. they are hard and tuff. i don’t know how she chews them up. but she begs for them all the time. she had all her shots and was checked a month ago and was great. now i am so worried. Your pup probably has colitis. Give her rice and boiled chicken and a touch of pumpkin. If it persists beyone a day or so take her to a vet. We got a kitten from a shelter, but had been fostered since birth in a friends home. He is now 12 weeks old and is still having large soft stools some appear to have a little oil on them. He is active, but not typical kitten behavior. He has been wormed and treated for all parasites. He also was tested for FIP which was negative. What would you recommend? Pls help my 16 yr ol cat,cant poop,any home remedies,i dont hv pumkin,what eles? If it’s been a few days your pet needs to see a vet. We have a 5 week old pitbull puppies that has had a bowel movements in a week. No seems to be in pain. We had the same problem las week, so we took him to the vet. Now he’s back to being constipated. I gave him some squash, i have a baby so i have some. Is that just as good as giving him pumpkin?? Tried the lubrication and still nothing. Vet isn’t cheap. Any help please??!! Puppy hasn’t gone poop. What I meant to say. He look to be very uncomfortable. Can’t afford right now to keep taking him to the vet.